You can start the countdown timer in the options menu under TIME & DATE » Countdown. 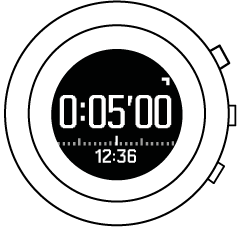 Once you set the countdown time, the watch shows the set time and a countdown bar. Scroll to Countdown and press the middle button. Set hours and minutes and confirm. Start and stop the timer by pressing the 7R button. While the timer is running, you can skip to the next minute (zero the seconds) by pressing the lower button. You can reset the timer by keeping the 7R button pressed. When the timer is expired, you can return to the main time display by pressing the lower button.